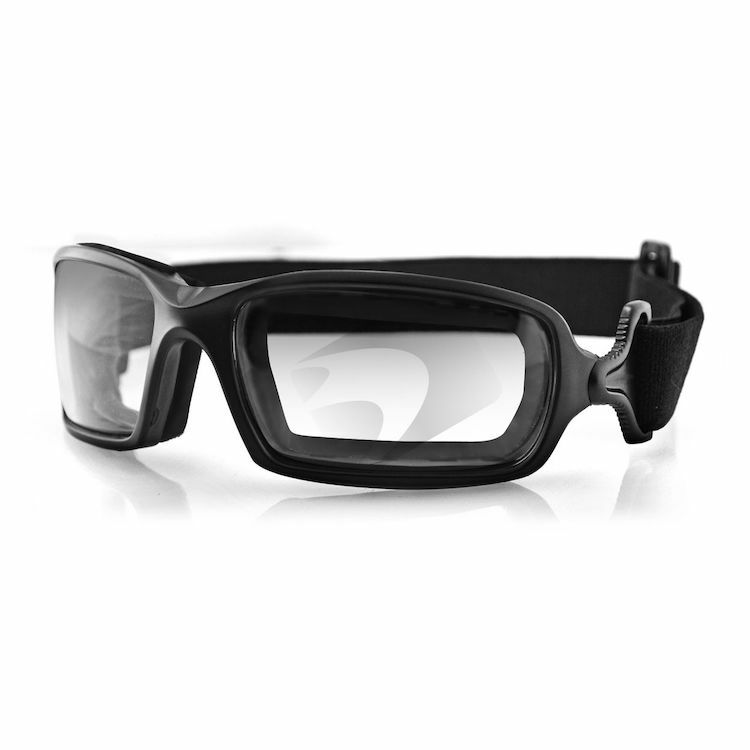 The Bobster Fuel Goggle comes with a lens that get darker in the sunlight and a neoprene foam lined with fleece for additional comfort. The clear lenses are photochromic starting with a light tint (85% V.L.T.) and transform to a medium gray (25% V.L.T.) in bright UV light. The yellow lenses are photochromic starting with a yellow color (VLT 72%) and transform to a smoked tint (19% V.L.T.) in bright UV light. Equal to HD version, maybe not as comfortable, but quality good for price. I purchased for use with open face helmet when riding my Harley Davidson Street Glide. The photochromic feature worked well with light tint to yellow. I especially liked the yellow tint when night conditions. The lens and foam has held up well after use for 4500 miles to date. one small benefit is the way the strap attaches to the frame - it allowed me to wear with the strap outside the helmet as on my motocross helmet( / goggle. I even added some silicone to make a nonslip / grip to the inside of the strap - again like a motocross goggle is made). I like these because they block out all of the wind to my eyes, automatically darken in the sun, and the goggle strap is easier on the ears under a helmet. I wear a head wrap under the goggles so the strap doesn't ride on my ears too much. I rated them as a 5 because I couldn't rate them a 4.5 (I think 4 is too low). I think the goggles don't darken enough on bright days, they're like a light smoke, not a dark smoke. With that being said, they're still better than swapping out lenses or carrying two sets for day and night riding. These have performed very well over 10k miles. They do not get really dark but let very little wind through. I use them mostly at night and I find them very comfortable and durable thus far. These glasses performed perfectly, they tinted instantly in the light and held on tight when flying through the curves. They looked great when teamed up with my Bell Rogue helmet and never gave me any issues. I really thought these were the answer - one pair, bright or night. These things started out clear with a slight smokiness, and that's it. Never darkened. deberian poder tener las patas regulares de unos lentes normales, con mis casco son muy incomodos, al girar la cabeza molestan en la nariz, no se oscurecen practicamente nada. Needed a pair, not too big. For the open face helmet I just purchased. I needed some goggles that wouldn't make my wide mug look like a fly. These goggles fit perfectly and the tint is just fine. Even the yellow tint at night helps me see just as good, if not better than clear lenses. Just a sweet set of goggles! What else can I say? No fogging i had experience couple of days using , but its sunny day. The only fogging I had was in high humidity and heat but it was miner..so in general no..
Do these goggles protect your vision from UV light? For a full face helmet nope!! Will this product fit AROUND the helmet? Will this goggle fit around the outside of the helmet? BEST ANSWER: The "BOBSTER FUEL PHOTOCHROMIC GOGGLES" do fit around my 3/4 helmet. The only issue I ran into was that they googles end up not sitting flush to my face. The hinge on the google strap cause the lenses to hover over my face and not tight. Best to wear the googles around the head and then put the helmet over the top.